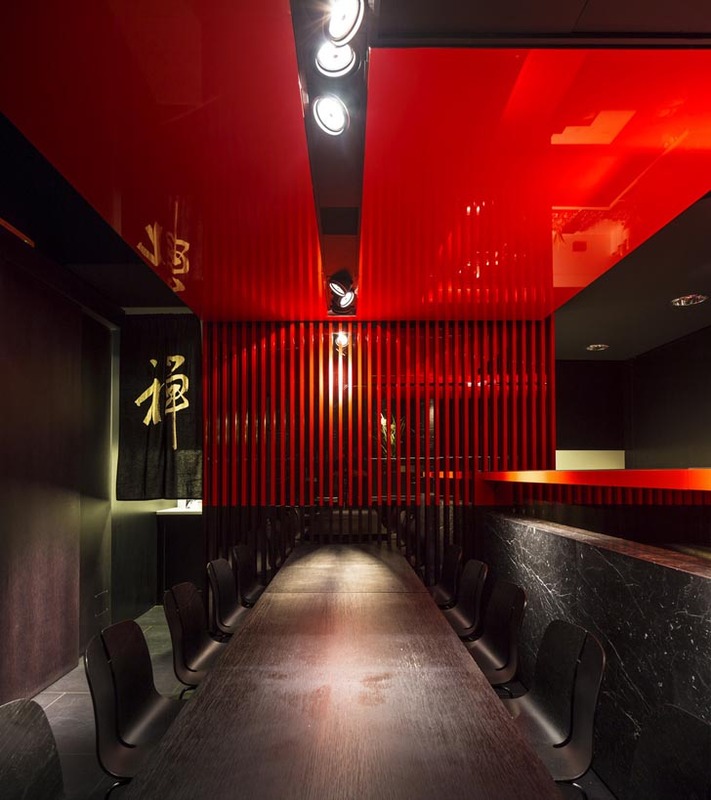 New Black N Red Look of Japanese Sushi Maker Restaurant in Rome, Italy design and decorated by Carlo Berarducci Architecture. 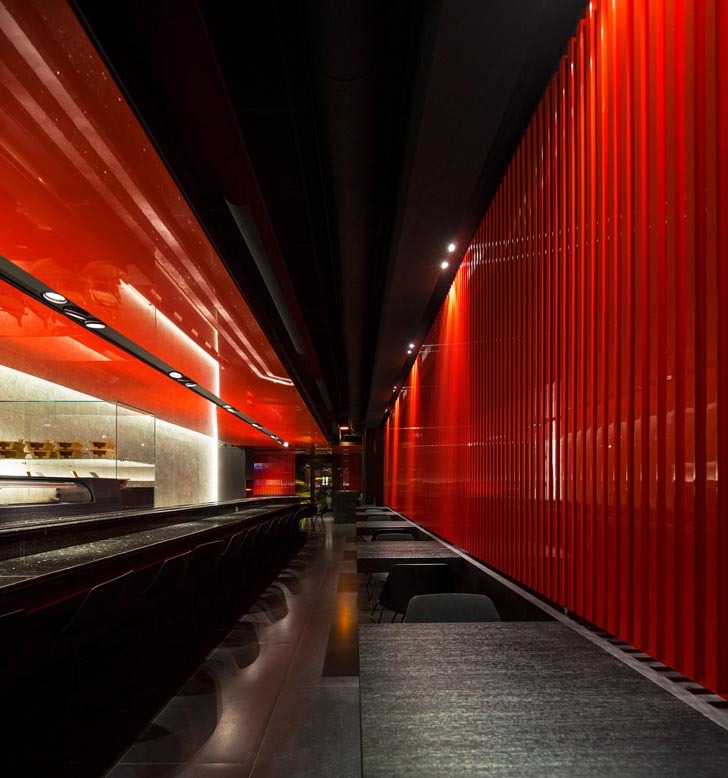 This Japanese Sushi Maker Restaurant in Rome is inspired by the walkways in the forest bordered by the succession of blacks and glossy orange-red wooden portals, which lead to the temples of Fushimi Inari in Kyoto, of which reproduces colors and suggestions. 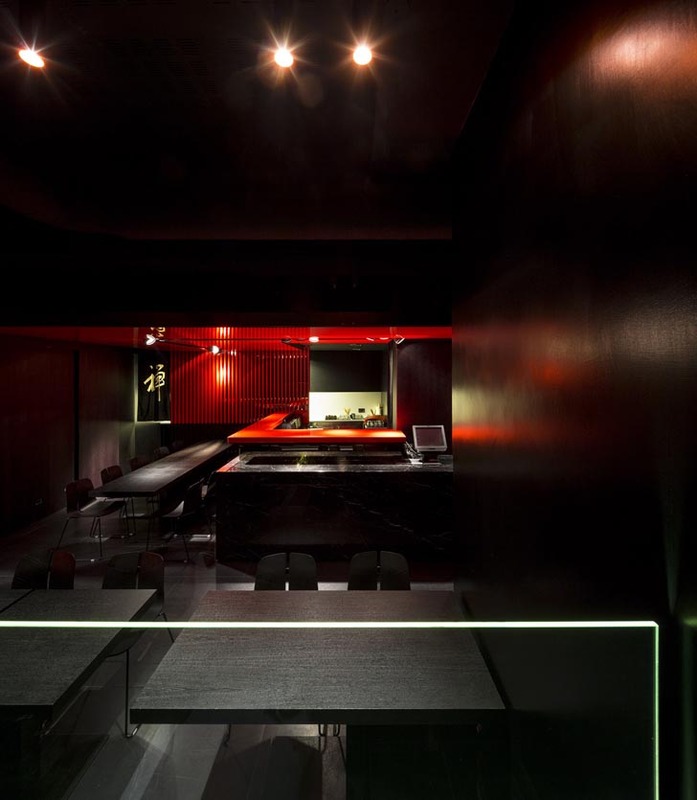 The ‘zensushi’ Japanese Sushi Maker Restaurant in Rome, was conceived as a linear process. 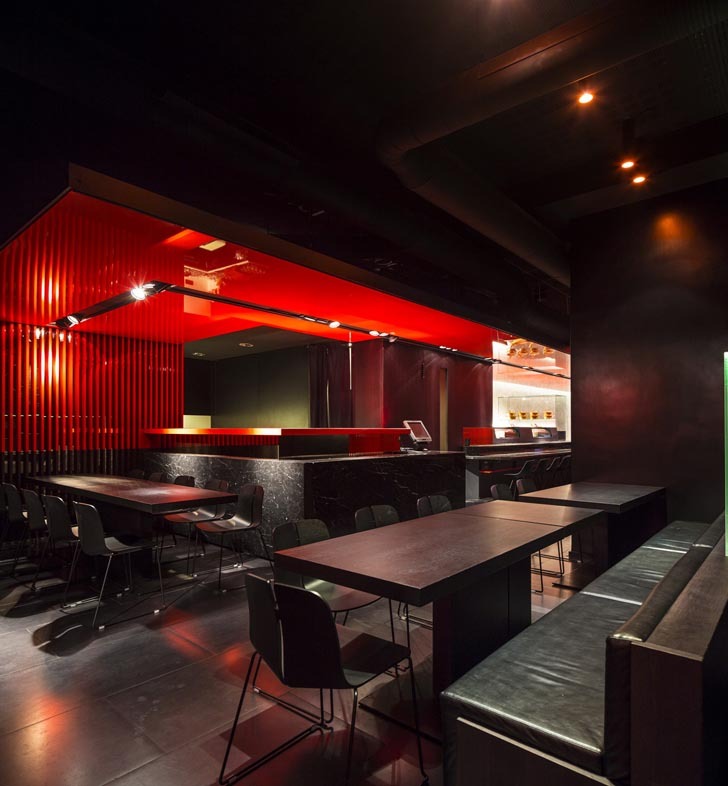 Steps and direction changes are taken bit by bit, continually leading deeper into the yo sushi eatery, but never losing the innate Zen Sushi Restaurant sense of openness. 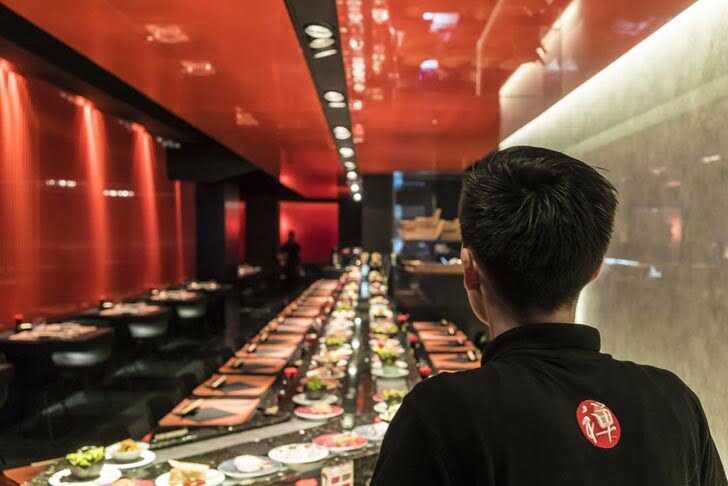 Zen Sushi was the first Japanese sushi maker restaurant to bring in Italy the Kaiten, the particular conveyor belt to serve freshly prepared sushi on colored saucers indicating prices. 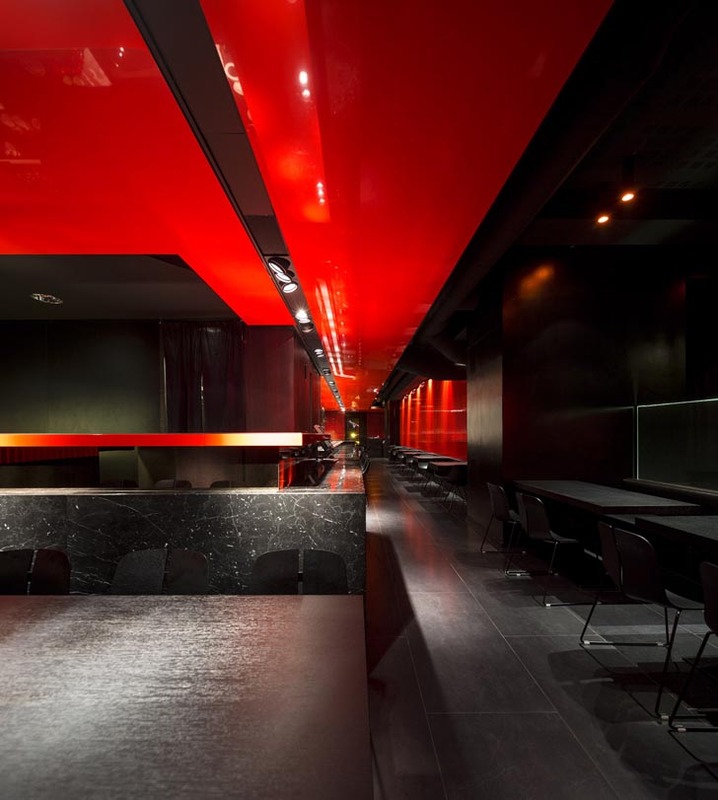 On the tenth anniversary of the restaurant in Rome the property wanted to give a new look. 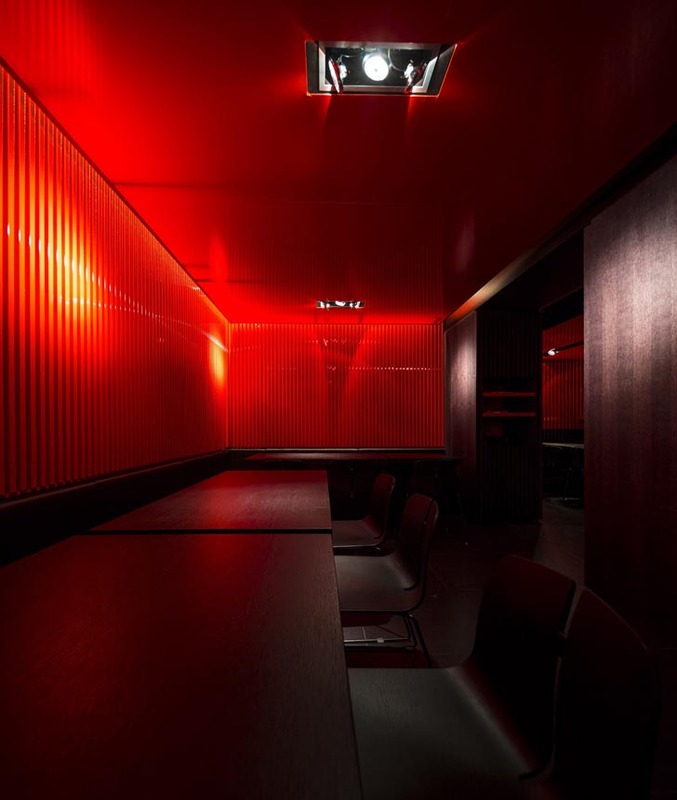 The design challenge was to create a space with a truly Japanese essence in a contemporary way recreating the suggestion of colors and materials of the temples of Kyoto. 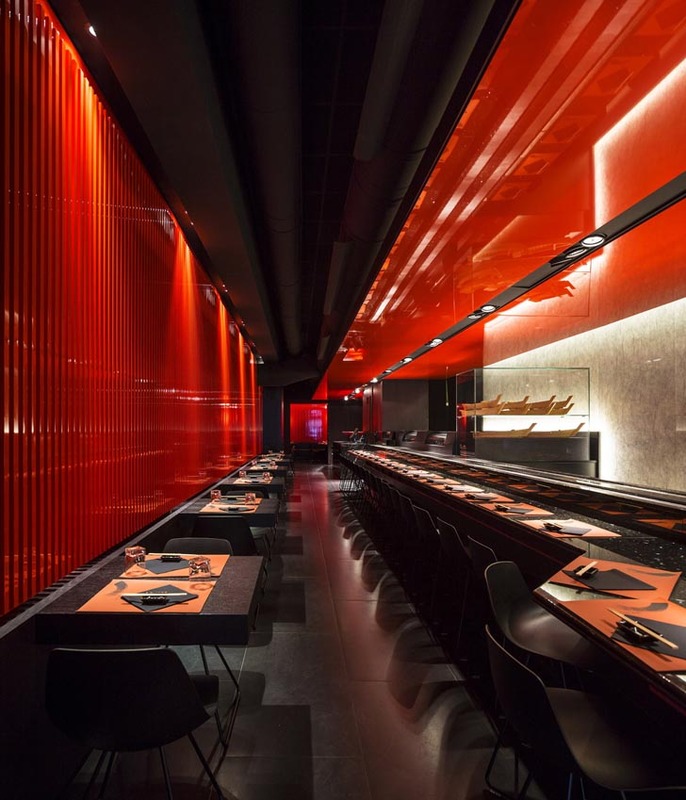 The Japanese Sushi Maker Restaurant, which gradually reveals the environments without closing the perspectives, invite you to explore the interior spaces. Dividers and walls formed by the close succession of hundreds of vertical elements of black wood lacquered from one meter up of glossy Black N Red, Orange drive and mark the going throw, and red orange reflecting suspended ceilings identify the different areas of the hall, the sushi mat bar and the sushi table rooms. 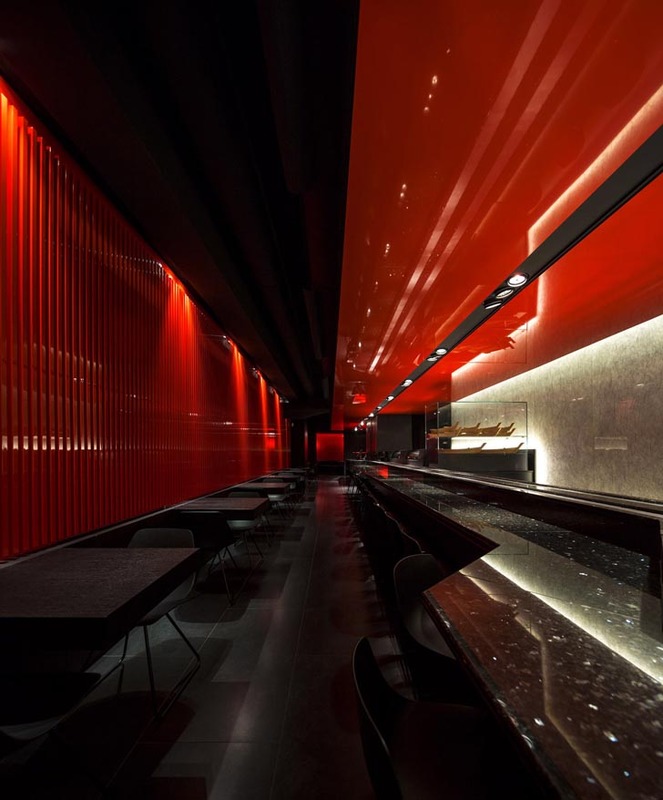 Suspended pvc lacquered ceilings the same color emphasize the visual perspectives and define the different areas of the entrance and waiting, the long bar sushi bar with the Kaiten, and a small more intimate sushi room in the bottom that can be reserved for private dinners. 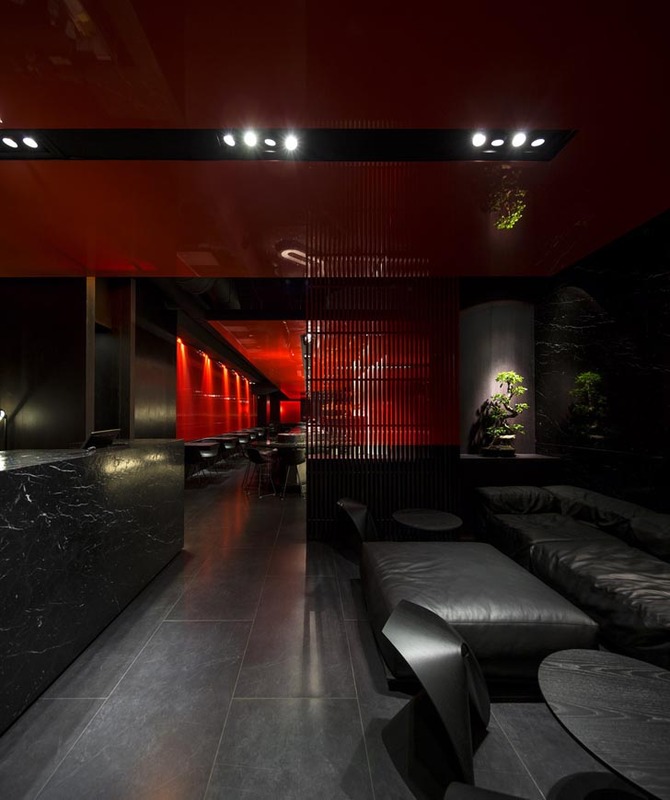 Two rich black polished marble walls are the backdrop to the entrance area and the room with the tables where the marble wall continues along the staircase leading to the bathrooms downstairs, reflected on the opposite mirror walls that multiply the percept of the Japanese Sushi Maker Restaurant space. 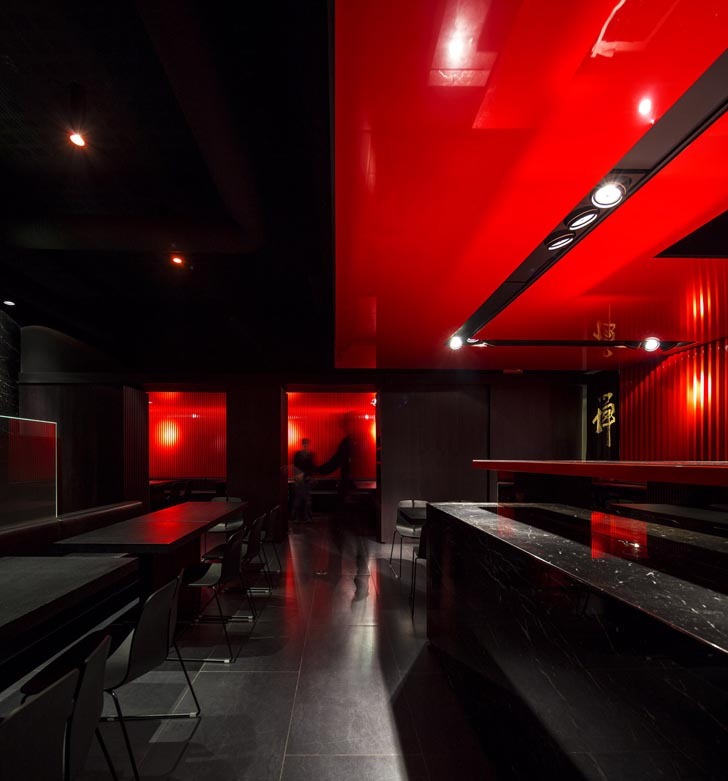 The same marble with a brushed finish as worn by time are used for the reception desks and sushi bar as massive quarry blocks resting on the floor, while a rice paper backlit wall underlines the central focus of the restaurant, the Kaiten and the open workstation of the sushi maker master. 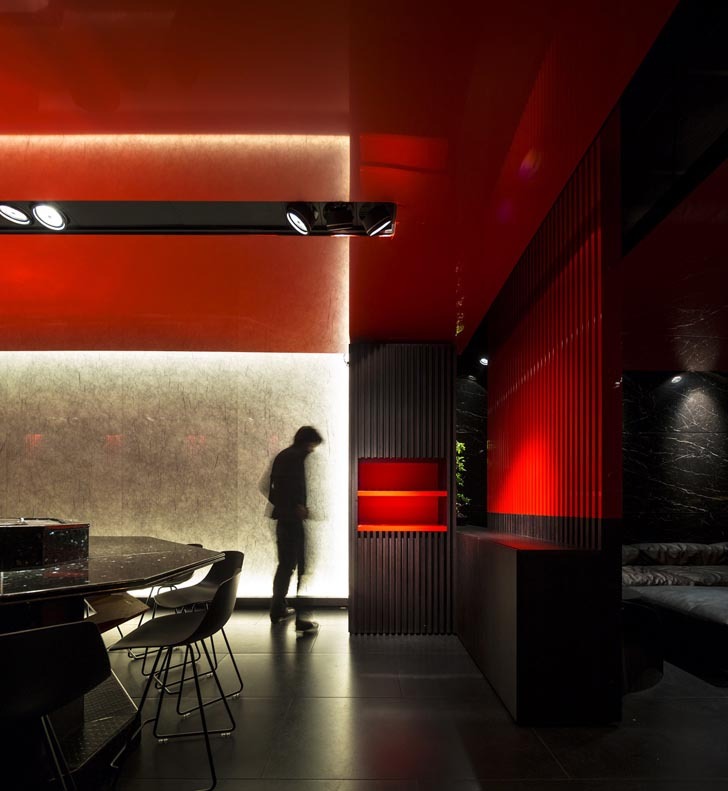 Porcelain tile floors and matte black painted ceilings together with black n red orange painted exposed air systems make the space container completely dark and neutral leaving out only the red orange back-lit ceilings and the red orange walls hitting by a punctual lighting that makes them look like fiery, revealing multiple scenes in an environment where you can not perceive the involucres. 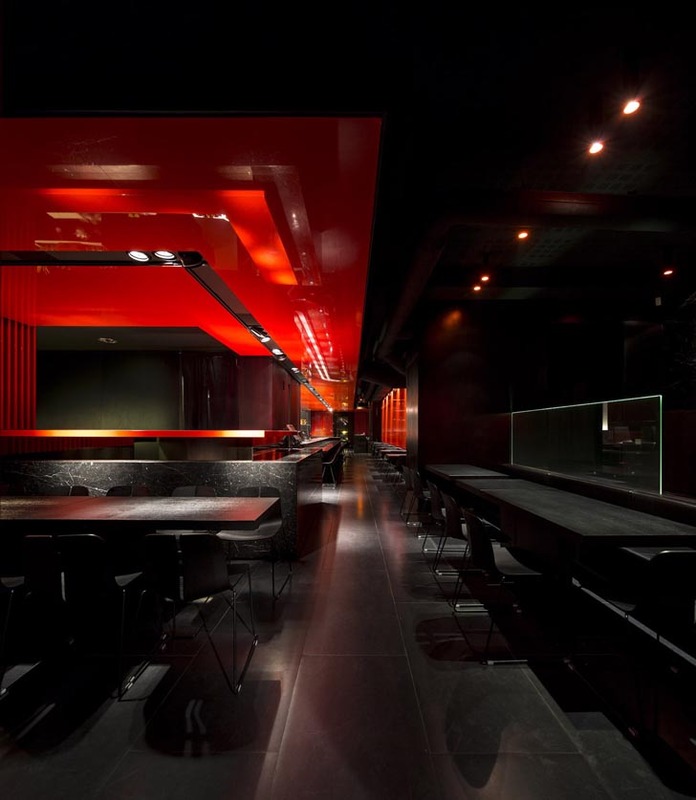 In short architect make this entire drama of Japanese Sushi Maker Restaurant with lacquered wood cladding, suspended, reflective ceilings, black marble walls, and a backlit rice paper showcase all accent the space, translating directly from the fushimi inari temple of kyoto. In this Japanese Sushi Maker Restaurant of Rome, I really amazed and like the idea of conveyer belt to serve sushi. Because generally in any restaurant around the world- either you get services by your self or by waiters and staff. But here I like the features of conveyer belt to serve sushi. 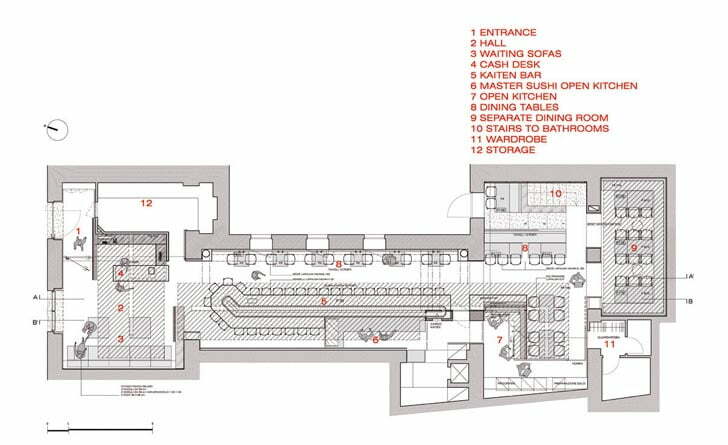 Also, black floors and ceilings fade into the negative space, accentuating the fiery red-orange color scheme. 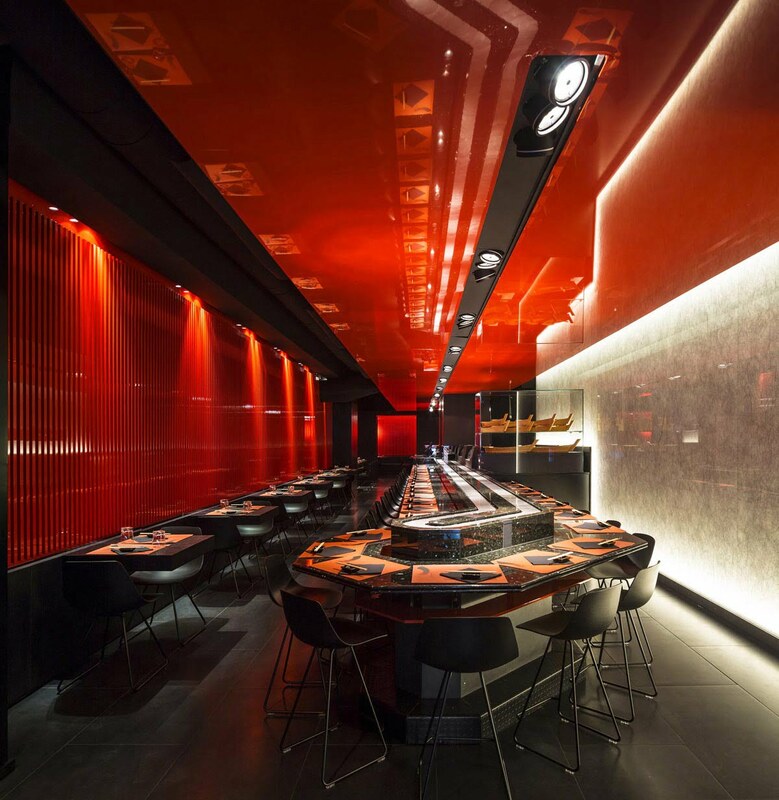 The central focus of the space, it provides a subtle spotlight for the kaiten – Conveyor belt sushi – and the sushi master.